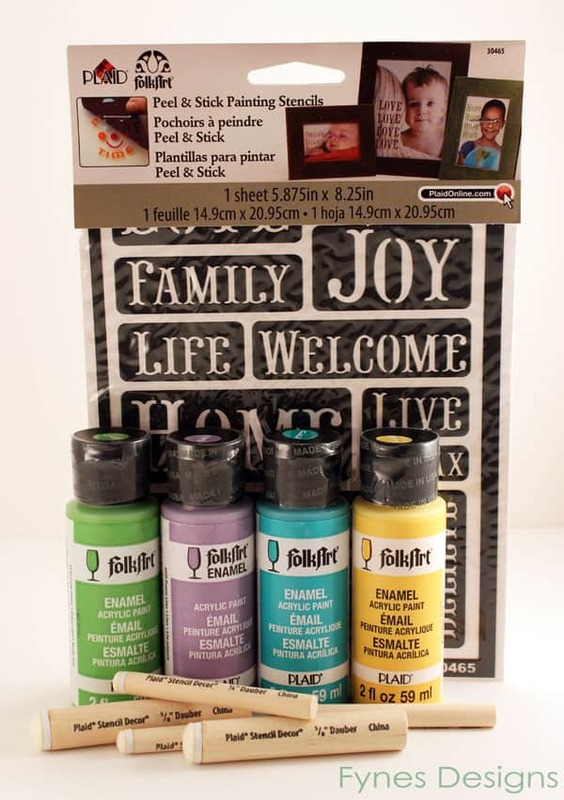 I was totally jazzed to receive a box of FolkArt Enamels from my friends over at Plaid. I’ve never used enamel paints (or painted on glass) so I was excited to give these a try. I pondered for quite sometime over what to make, but when I started to get out my Easter decor I knew it had to have spring in mind! ‘lightbulb’- Painted plant pot! The plant pot had been sitting around my garage for the winter so the first thing I did was give it a wash with some rubbing alcohol (ok I’m lying.. first take the dead plant out from last year, then wash). 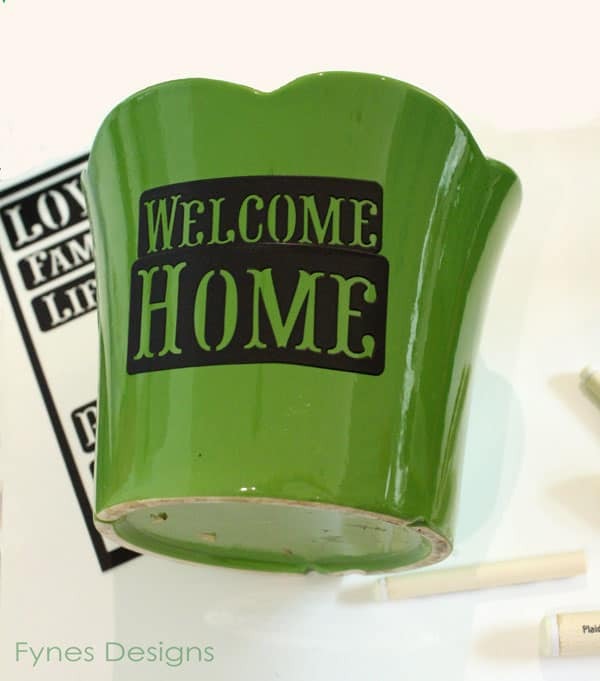 Then simply peel your stencil of choice (Welcome Home) from the plastic backing and adhere to the plant pot. Next, using the Plaid Stencil Decor daubers and the color of choice, dab paint in the openings of the stencil. When the painting is complete, slowly peel away the stencil from the plant pot. This paint begins to set quite quickly so I recommend doing it promptly to avoid ruining your design. 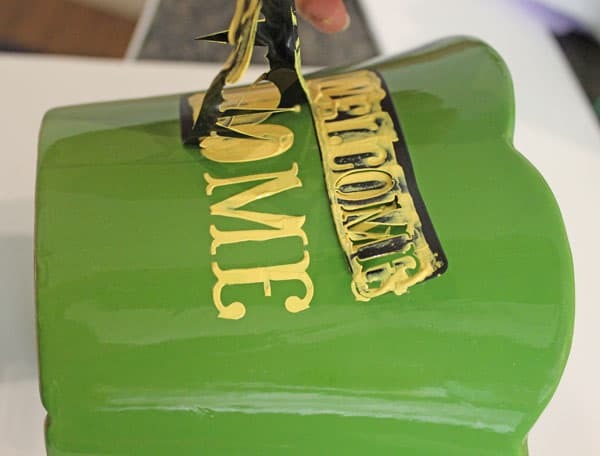 I wanted to avoid the stenciled look but maintain the font, so when the stencil was removed, I took a small paint brush and filled in the bottom and top of the ‘O’ where the centre was attached. Wouldn’t this be perfect treat for the gardener on your list, a new neighbour, or as a housewarming gift? I was totally intending to shoot this hand-painted plant pot on the door step of my home, but winter crept back into my springtime and blessed us with another snowfall. Miss my last DIY project? Get some fabulous DIY mirror etching tips here. I wrote this post as part of a campaign with Plaid and Blueprint Social. The opinions in this post are my own. 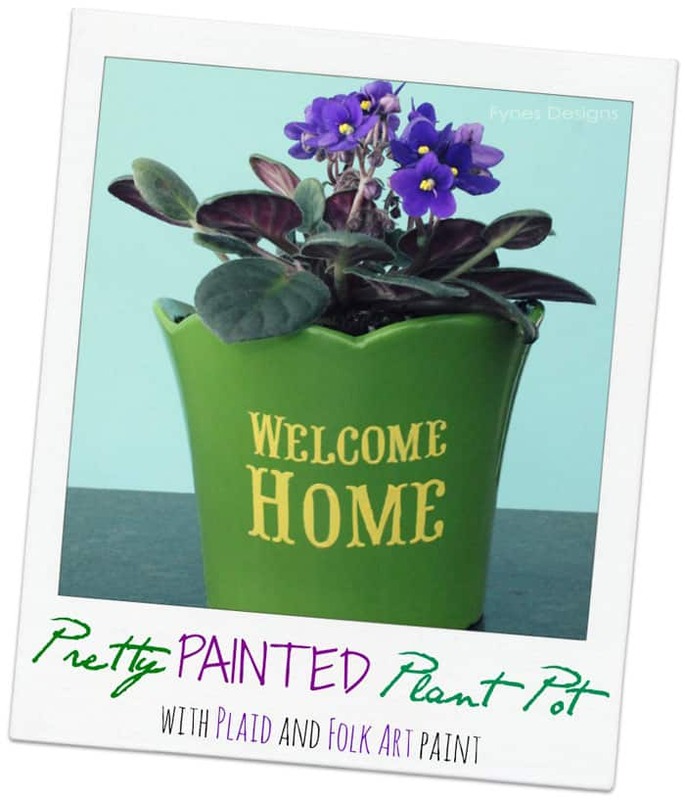 So pretty and Plaid paints are wonderful to use ~ great choice. I love the potted plant idea! I almost went and got one but wasn’t sure what I would put on them. I think your Welcome Home is a perfect choice! Thanks Janette, I really struggled with what to put on it, but I think this works well too! I love this idea…what a fresh breath of Spring!!! Love your stencils also. I had so much fun with the paints and stencils. I love this idea! 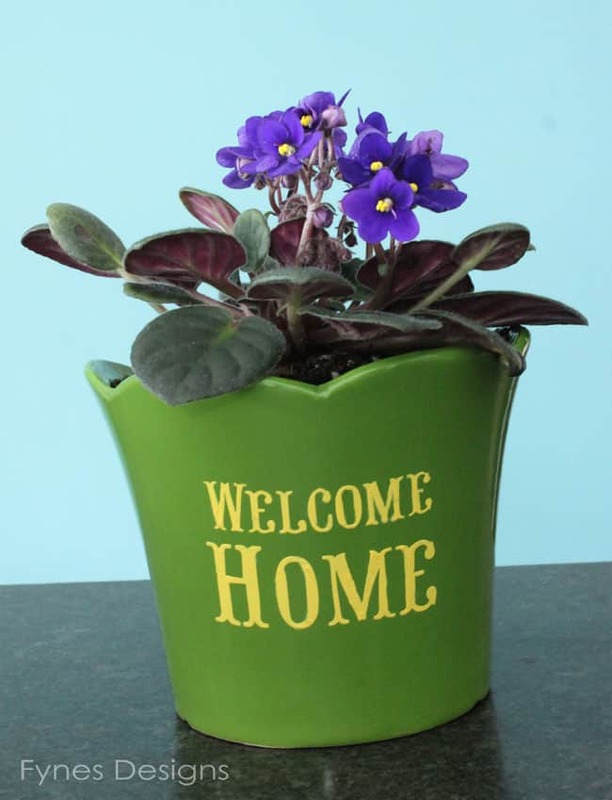 What an easy and cute way to personalise a pot! Thanks! Makes a great personalized gift. I love this!! I really like the yellow against the green – pretty!